One of the most innovative labor arrangements in US industry is in danger of falling apart, as union workers at Spirit Aerosystems are suing the company for its plans to sell off a major division, which will result in a large number of layoffs from outsourced production. When Spirit Aerosystems was spun out of Boeing as a separate company in the mid-2000s, then new CEO Jeff Turner was convinced that the traditional approach to labor relation, with its heavily unionized factory workers, wasn't right for them or the company. Having been through the types of problems that labor strife had brought Boeing in the past, and believing deeply that the dominant model for contracts with the unions was a bad strategy for the highly cyclical aerospace industry and its workers, Taylor challenged the unions to consider a different way - one that to date had paid off big for both sides of the equation. The Machinists union alleged in the suit that the sale of the fabrication division violates a pact it said required Spirit to "maintain major manufacturing operations and union jobs in Wichita as long as the contract is in effect." However, last week, the company's largest union filed suit, alleging the aerospace supplier had violated the innovative collective bargaining deal with plans to sell a Kansas-based unit and outsource other work. 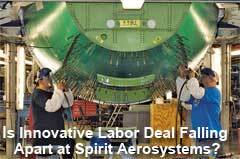 The complaint, filed by the International Association of Machinists and Aerospace Workers, alleged union representatives were notified by Spirit officials on May 29 that the company intended to sell its fabrication division, which produces specialized aerospace parts for larger assemblies. Union leaders were told by Spirit the move would lead to 1,200 layoffs, with outsourcing affecting another 200 workers, according to the complaint. Spirit Aerosystems, headquarter in Wichita, makes systems for both commercial and military aircraft, focused primarily around fuselage sections and pieces of the wing assemblies. It currently has sales of over $5 billion, spread across three factories near Wichita and one in the Southeast area of the US. Spirit inherited labor contracts with several unions after the spin-off, but soon entered a new round of negotiations as the existing three-year agreement was set to expire. At a manufacturing conference at MIT in 2012, Turner noted several issues with the status quo. First was that each new negotiation fostered a "win-lose" mentality. Every agreement led to a sense that either the company or the union won that battle, and which side won was usually a reflection of economic conditions for the aerospace industry at the time. In better times, the union tended to win, while the company would usually be seen as prevailing in weaker economic periods. Second, when the inevitable downturns hit the industry, Turner said the usual pattern of steep layoffs would occur, giving the employees, especially newer ones, little in the way of job stability or security. 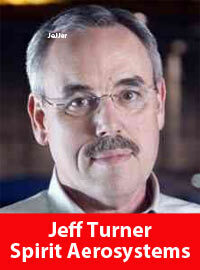 "That's no way to run a business, a family, or a nation," Turner said at MIT. The issue was especially salient for Spirit given its age demographics. The average age of factory employees was already 50 at the time the company was spun out. If there was a large layoff resulting from a major industry downturn, that average age would likely rise to an incredibly 60 years old. The traditional contract with the unions would be for three-years, and provide guaranteed, substantial wage increases during the course of the contract, on top of a wage that was already well above general manufacturing averages. With growing complexities and challenges from customers and competitors worldwide, "We just couldn't sustain the business in that environment," Turner said. When the negotiations for a new contract were beginning a couple of years after the spinoff, Turner said he decided to personally visit the offices of one of the major unions, where national leadership was training local union officials on best practices in negotiating techniques. During this unexpected visit, Turner said he described to union leadership how he viewed the situation, and the risks to the company from the status quo. At the same time, he listened to the union, and found the biggest fear was simply that the company had no commitment to the workers, and would be happy to jettison them if a better deal - such as offshoring - came along. That basic dialog set the stage for a new relationship and contract that would ultimately benefit both sides. The contract ultimately developed and approved by a variety of unions operating in Spirit was of a very different sort. First, it was for a full 10 years, rather than the traditional three. Second, defined wage hikes were extremely modest, four different 1% hikes over the course of the 10-year contract period. There was more: Union pay became more variable. Factory workers could earn as much as 10% additional pay - or take home 4-5% less - depending on how well Spirit performed in the market and financially. Critically, that variable pay approach didn't just apply to apply to blue collars factory workers, but management and executives as well, who had a lot more upside but also a lot more downside in terms of compensation. This approach would allow Spirit to share the rewards from factory floor to executive suite when it was enjoying prosperous times, and also to reduce its losses when the market went the other way. The approach would also motivate blue and white collar employees to focus hard on efficiency, innovation and customer service, which would accrue to their own benefit. An even greater departure from the traditional approach was how employees would be handled if a downturn was severe enough to cause layoffs under normal conditions. Instead of layoffs, however, the Spirit contract calls for reducing work days for everyone, down to say three days per week of work if needed. Turner said that while some elements of the unions at first rejected this approach, the concept has now become very popular among union officials and rank and file workers. The new relationship meant "we can keep the company healthy and the team intact for the long term," Turner said. "We also convinced the workers that we really considered them part of the team, not just a factor of production." "The company, the union, and individual workers have a mutual commitment that we are going to keep manufacturing in the US," Turner said. That was then, this is now. Turner retired as CEO in 2013. New CEO Larry Lawson appears to have some very different views. Labor relations had been deteriorating since he took over in early 2013, with hundreds of jobs being cut. The Machinists union alleged in the suit that the sale of the fabrication division violates a pact it said required Spirit to "maintain major manufacturing operations and union jobs in Wichita as long as the contract is in effect," according to the complaint. The union is seeking an injunction preventing any sale of the fabrication unit or layoffs at the business. "We certainly understand the obligations in our labor agreements, and believe we are in compliance. Spirit does not comment outside of the legal process regarding pending litigation," said a Spirit company spokesperson. The spokesperson added that spokesman its strategic review was continuing and the company had made no decisions about plant closures or sales. "We're also looking at the things that we do versus the things that we could buy. And whether those things are core to our business," said Mr. Lawson. "We're attacking that part of the business model." The company has more than 10,000 white collar and factory workers in the Wichita area. "The issue here of course is one of trust," said SCDigest editor Dan Gilmore. "If the unions feel the new management is not living up to the agreement they struck in 2010, then when the next round of contract negotiations arises, it will be back to the traditional "win-lose" model that Turner had tried to break." It seems the few years of innovative labor relations at the company, which could be a model for hundreds of other firms, is simply going away after a few years of success. What is your reaction to the labor pact at Spirit apparently falling apart? Let us know your thoughts at the Feedback section below. This company used to be family-owned. Now it's only about the rich getting richer. The hell with the middle class people that keep the jerks pockets filled! The Union will win and the company will end up failing and taking a huge loss like usual. People need to realize that the whole town of Wichita will take a huge hit if they continue to contract jobs for cheap unqualified workers. Spirit is falling apart and that won't change until someone stops the Lawsons and Turkles of the company! They receive the 1 million dollars or more in bonuses while the real people suffer. The people will get even, it's just a matter of time! Interesting that you would call what Mr Turner negotiated in 2010 a win-win deal. It was no win-win when those of who worked for Boeing (I had 25 years at the time) were sold in 2005. 850 were fired and those who were left had our pay cut 10%, increased insurance payments and our VIP match elininated. In 2010 we'd hoped to recover from that disaster, but it was not to be. A 10 year contract brought stability for the compnay, but it also brought the rank and file a paltry 4% raise over the life of that contract and tiny payments in between that don't amount to a hill of beans. Bottom line, at this point we are not making what we did 9 years go, while the company has profited handsomely. But that matters not at all to Mr. Larson, he is determined to beggar us further by laying us off rather than honoring a contract we all signed in good faith. But then I suppose good faith and honor are not in his vocabulary. Turner was more satisfied with a good but more average salary for a CEO. Lawson is more interested it apears in hauling out big short term monies from the company coffers and hiring ex Beech accomplices to do the same. Then they will all serve on boards and give each other job opportunities after they leave here in a few years. They will have no track record of doing anything worth while to bring true equity to the Spirit company. I see nothing to show Lawson or his Beech buddies have done anything of value for Spriit Wichita yet. When top company officials take out large sums of money it is really just company equity they are taking that was put there by the sweat of real people doing real jobs long before they showed up in most cases. This place has never had this bad of morale ever - Larry Lawson is destroying our company. I have 27 years invested and he has 1 1/2 years and has already made more money than I will see in my lifetime. They don't care who's lives they ruin. I feel that with Jeff Turner's retirement we lost a partner and a man of integrity, the environment at spirit now speaks for itself and those who run the business! Spirit management should be ashamed. Just the thought of what they are attempting to do affects the lives of all involved. I hope it backfires on them. The contract was finalized long before Mr Lawson came on board. He is acting like the old school Boeing, which incidentally never picked him up when MD sold, an archaic attitude. They formed an agreement between the company and the union. They chose to go 10 yrs, some of us told them that was a bad idea but they persisted. Now they want to renege on the agreement that they signed, other than Lawson, that is. It should be a wakeup call to all their customers that Spirit's word isn't worth the paper it's written on. In all of this, Boeing is being very quiet. The bulk of the work belongs to Boeing and they will have a say as to where it is done. I've been here for 19 years and never have I seen the things that are going on now. Personaly I think our new C.E.O. is just trying to line his pockets and forget the workers that have put their hard work and sweat into this company. For alot of us, this is the only work that we know. So I just don't understand why they would do that to the people that has dedicated their entire life and career to a company they used to love. Nothing new here. When the big dog wants a change, a change it gets. Here's the thing. All companies like to and must make money (profit). When the amount they make is below what it should be, due to whatever reason, then changes in operations have and will be made. This must happen in every case or the company will fail. Not a really good idea for anyone. When workers production is so low per units manufactured,that costs exceed value, changes have to be made. The fix hurts some far more than some others,however that is not a valid reason for the company to shirk it's responsibility to make a profit. The most appropriate fix to the problem and that effects far fewer employees is to accurately identify those whose production falls short of required levels. Those employees need to be terminated and their jobs filled by personnel who will produce to the established standard thusly bringing production costs in balance and allowing a profit to the company. And best of all, for the majority of the employees continued employment. Think about it, would you want to pay someone to do a job for you that should take three hours and takes that employee five hours and costs you almost twice as much as it should. I wouldn't and I don't think you would either. Do it now and do it correctly and lets all get with the program and save our jobs and the company. The company has always tried their best to lower wages and provide for an unhappy work force. The idea of making the employees feel like a team member was a totally new concept that the union took a chance on and if the wording in the contract can be construed as such, then the union has a legitimate gripe. Turner was trying to actually I believe do best by the people but they, the Boeing Company, found this to be not to their liking and input a head hunter like Larry "the Axe" Lawson. As much as we distrusted Turner, he pretty much kept his word and worked with the Union, as an ex Union Shop Steward. I know this to be true. However since "Lawless Lawson" took the reins, its been a different story. Management talks the talk of needing worker input, worker ideas, worker spotting problems and advice on a solution since we are the "Process Experts" and have the most knowledge. When it comes to implementing his talk, its all talk, we are told there is no money for small changes, to fix equipment, tools, etc.... Yet we have millions of $'s on hand, thus the high stock prices, but things continue to fall apart and be done the same old ways, costing us money that L.L. says we need to be saving. His solution is the "Old fashioned way", sell off, lay off, look for excuses to fire, etc..... Then wonder why moral is in the dumps.... Get rid of L.L., bring in someone like, but not exactly like Turner, finish turning this place the rest of the way towards a new future of doing things, cut the BIG Boys salaries they don't earn and limit bonuses to only when the do earn them. We trusted Jeff. He was homegrown and cared about people. Now we're left with the same process from years ago. It seems rather dated. Why not take a look at the stock activity among the executives at Spirit. That is what this is about. They own a lot of stock so they sell high, make an announcement, then buy back low. The company has no real leadership as to anyone that really understands aircraft. A 10 year contract locks both company and workers into a long term solution to a short term problem. As the article states, in good economic times the union appears to prevail and in bad economic times the company seems to be the winner. So a 10 year contract in good economic times locks a company in a losing contract for 10 years. Unless you can time the contract to end when the economy is doing poorly every time, all you have done is extended the good or bad effects.